Alastair Cook shook off some indifferent form, to score an epic 294 runs off 545 balls. As an Indian cricket fan, I sit here feeling flattened. As flattened as a gingerbread man being run over by a tractor. The 3rd Test just ended in Edgbaston an hour or two ago. And not in a long, long time, have I felt this disappointed at the performance of my team. The stats will tell you India lost by an innings and 242 runs. What they won’t tell you is the utter disregard in which India were swept away. Other than a brief rearguard by MS Dhoni in the first innings and some old-fashioned tonking by Praveen Kumar in the 2nd, India were in complete, utter shambles. The No. 1 spot has just not slipped away. It has been snatched away by men who have proved to be more competitive, tough and determined. There is no harm in losing. But there is a lot of harm in seemingly handing over a title, earned after much hard work and grit, in the space of three weeks of some of the most awful cricket, the country has ever seen. The gap between the 2nd Test and the 3rd Test meant the Indians were able to squeeze in a two-day tour game against Northamptonshire. What should have been an opportunity to get back some lost confidence, did not follow the script. India conceded a first innings lead and by all accounts, will be considered losers of that warm-up match too. The 3rd Test also coincided with images of chaos and disturbance in London and soon spreading to other parts of the UK. For a while, cricket took a backseat; there were fears whether the Test would even take place or not. But thankfully, good sense prevailed and the Test went ahead. And looking at the turnout with the crowd trooping in faithfully everyday dressed in a riotous colours and cheering each and every ball, it can be said that the right decision was taken. Edgbaston, on paper, promised a pitch which would aid the spinners and not swing or seam as much as Trent Bridge. Strauss thus took a bold decision by putting India in. Sehwag and Gambhir trooped out, no doubt, aware of the fact that with them being re-united again, it represented India’s best chance to scupper England’s well-laid plans. Well almost. Broad brought India back to reality with a brute of a ball to dismiss Sehwag for a nought. The script would prove to be painfully all too predictable; Gambhir sought to cut loose with some glorious shots, but he played one shot too many to Broad who yet again accounted for another wicket with a pitched-up delivery. Tendulkar, no stranger to pressure, strode in, and promptly strode back out again, trying to drive Broad and edging to Anderson at slip. All this while, Rahul Dravid, the best Indian batsman in this series by far, was doing what he has done best, all his career. Defending and blocking dourly, it seemed he had almost seen his way to lunch, before Bresnan produced the best delivery of the Test match, pitching on middle and strengthening to take out Dravid’s off stump. Raina never looked comfortable and succumbed to the double bluff perfected by England nowadays; pitch it short, short and slip in a fuller one. VVS Laxman who still hasn’t played the ‘Very Very Special’ innings the team needs; had got out pulling twice in the series before. He took India to a hundred with a exquisite straight drive before, yes, it’s true, pulling AGAIN, getting a top edge to long leg to Bresnan. Broad accounted for Amit Mishra, before finally MS Dhoni and Praveen Kumar launched a late rearguard, showing a bit of resolve. Dhoni and Kumar combined to hit a flurry of sixes, taking the total past 200 and Dhoni past 50. But the resistance did not last long as both Kumar and Dhoni were out within quick succession, leaving India a total of 224. It would be difficult to summarise the England innings, so I’ll summarise it using three words: grit, determination and relentless accumulation. 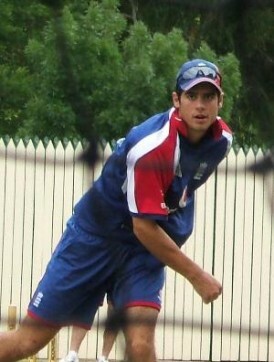 Cook’s innings will stand out, for his pure class, grit and application. Strauss would have fancied a century, but the umpire failed to notice a no-ball from Mishra and Strauss had to depart for 87. The rest of the England top order played knocks of different flavours, while Cook stood resolute at the other end. Bell scored 34, Pietersen an aggressive 63 and Morgan took advantage of Indian clumsiness (two dropped catches) to mix aggression and caution into another Test century, before driving to Sehwag off a Raina delivery. Bopara and Prior got out cheaply, but Cook remained, probably to murder Praveen Kumar and Co with frustration. England passed 600 easily, Bresnan getting to another 50 while Cook continued, going past 250. Just as England passed a colossal 700 with Cook six runs shy of a triple hundred, he played probably the one rash stroke of his innings off Ishant Sharma, uppercutting to Raina at deep point. England declared immediately, they had run up 710 runs for the loss of seven wickets; Alastair Cook had cemented his place as among England’s finest openers with a 294 off 545 balls, the second highest number of balls faced in an innings by an English batsman against India, next only to Geoffrey Boycott. India had dropped three catches through the course of an innings, one which prompted Rahul Dravid to throw his cap at the ground; they had looked listless and limp on the field and Amit Mishra had bowled more no-balls than the entire England team in the last two Tests. With 486 runs left to score only to make England bat again and more than 2 days, the result was a pretty foregone conclusion, even with the hint of rain, bad light or even malfunctioning floodlights. But there was always Sehwag, India’s latest Miracle-Worker. But even miracles need a bit of preparation as Sehwag, playing his first Test in three months, bagged a king pair as he tried to drive Anderson ferociously only to nick to Strauss. Dravid and Gambhir played out time till the end of the Third Day, but the average Indian fan would not even bother turning up the next day. The only question at the start of the 4th day was whether India could extend this till the 5th day which itself would be an achievement. They couldn’t even make it till tea. Anderson had Gambhir edging to second slip, before getting Dravid out with a snorter; however replays would later suggest that had Dravid asked for a review, he would have discovered that the bat had hit his shoelace rather than the ball. Laxman never looked comfortable before departing to Anderson, who had bagged the first five Indian wickets. Swann had been causing problems and after a close shout to Gambhir turned down the last evening, he accounted for Raina with a slider. Sachin Tendulkar though looked like he was playing in a different Test match, with some silken shots before getting out in the unluckiest way possible, run-out at the non-strikers end while backing up. Mishra left soon, but Dhoni and Praveen Kumar, probably in a fit of frustration decided to get some of their own back. Kumar after getting knocked on his finger, thrashed Swann all around the park, hitting three huge sixes before finally top-edging to Bopara on a Broad delivery. Dhoni tried to delay the inevitable, scoring another quickfire half-century and looking more and more like the man who hit a straight six in the World Cup final. But Broad accounted for Ishant and Sreesanth really couldn’t hold on. Fittingly, it was Bresnan, probably the most improved cricketer in the series, who accounted for Sreesanth with a short of length delivery, sending the English team into delirium, the entire Indian nation into a fit of frustration and the No. 1 spot out of their pockets. England had bowled India out for 244 and had won by a whopping margin of an innings and 242 runs. I have seen the Indian team in a lot of series over the past 10 years…Australia 2001, England 2002, Australia 2003 and then 2004, South Africa 2006, England 2007, Australia 2008,…there have been plenty of series defeats but a 3-0 thrashing is something I only remember from the days of old when India were very far away from being considered a superpower. This has been an embarrassment; it has been men against boys and unfortunately, despite whatever they’ve achieved in the past, India never looked No. 1 at any point in the series.